Seven 3-story urban homes - 3 remaining NEW units, with re-sale homes available! 2 car garages, whirlpool tubs, stained concrete and hardwood flooring, exposed block construction, steel-and-wood staircases, and contemporary lighting all make these homes feel exclusive and urban! 1,339 to 1,760 sf foot homes offer layout flexibility, including 1st floor dens, guest rooms or office spaces. All homes have front porches and 2 balconies, so you can enjoy outdoor living. 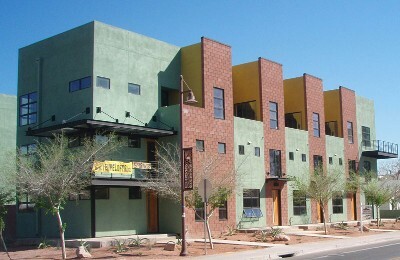 On 5th Street, walking distance to Mill and Tempe nightlife! Priced from the mid-$400s for 1 bedrooms, high $400s for 2 bedrooms, and high $600s for 3 bedroom units. Contact us at 5thSt@WeAreAZRealEstate.com for more details!